Ancient landscape architecture is infused with sonic memory that speaks directly to the human central nervous system; location recordings in Canada of “songs in the land” serve as a potent demonstration. Landscapes are inhabited even when they’re empty. But what happens to cultural memory when the teachers are all dead and their stories have gone missing? 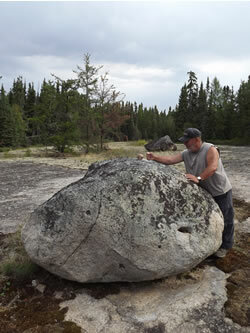 It’s a question I have worked with since encountering Indian “rock art” pictographs in Canada, nearly forty years ago. 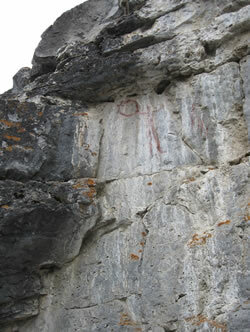 Pictographs (Fig. 1) — red ochre dreams painted upon a rock face — are a way of remembering. The visual artefacts can be interpreted like one might cipher a mathematical equation for numinous geometry — space that’s transparent to consensus reality. Pictographs also tell of phenomena beyond the sense of sight; they can point toward persistent and unusual sound at “special places” on the land — sounds that inform and shape human experience. And if you know how to listen, the sound that arises from the play of wind and waves and the weather on the landscape can put you into a timeless frame of mind. I’ve been interested in bells, chimes, carillons — gongs of every sort. I was reading a 19th-century argument for not keeping bell-ringers on call at a small church in France. The parish was down on its luck and couldn’t afford to retain the bell- ringers (24 hours a day, 7 days a week) as insurance to tone down the ill effects of a thunderstorm; citizens were frightened that there would be the devil to pay, if they didn’t. And I wondered why people believed that bells might have any affect on the weather. But turning the question around, I wondered what kind of affect the ringing of bells was having on people? Audio 1 (18:20). Thunderstorm with drone intervention. I made a recording in 2009 during a wild night on a mountaintop in British Columbia (Audio 1). The underlying sound of an elongated drone has been added. I had a hunch about the storm that I tested in a neuroscience lab. I wanted to learn what the psychoacoustics of the thunder was doing to people (in this instance, volunteers for an experiment). Psychoacoustics is the science of how sound is perceived by the listener. My colleagues and I at the Neuroscience Research Group at Laurentian University in Canada (where I’m an associate researcher) learned how the droning sound serves as a calmative — a tranquilizer. By adding drones to the recording of the storm — the long tail of sound in the moments after a bell has been struck — what formerly disturbed and was unpleasant to the listener became pleasant. Brainwaves changed. The volunteers wanted to hear the altered soundscape again and again; they liked it — like it was a drug of choice. Psychoacoustics can be a potent mnemonic device — a memory system; however, the sound of “special places” is typically overlooked by anthropologists and archaeologists (possibly because they didn’t hear what they were not listening for). Writing-On-Stone is a protected park in southern Alberta (Figs. 2-4). There are ancient images pecked out on the sandstone cliffs and hoodoos that snake alongside the river — miles upon kilometres of petroglyphs — the largest collection of its kind in North America. There’s also a persistent wind that blows out from the Rocky Mountains — Chinooks, they’re called when it really blows strong — that shapes an acoustic environment. 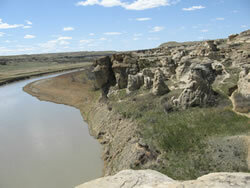 We’re in traditional Blackfoot Indian Territory. 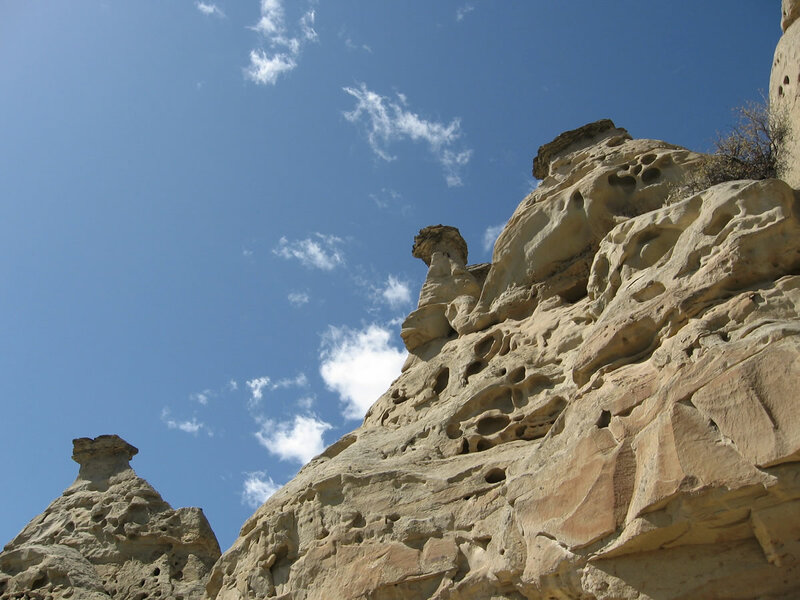 And here, in Writing-on-Stone, the sandstone is shaped by the wind, which in turn creates a surreal harmonica-like affect as the wind whistles through the hoodoo formations. In the lab, I learned that these sounds have a potent affect on human cognition and perception. Omahkiyaahkohtoohp is a Blackfoot Indian word meaning the “old, big arrangement.” It’s another “special place” a couple of hours east of Calgary (Figs. 5-6). 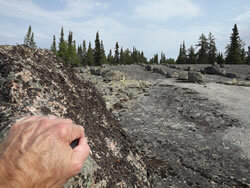 There’s a persistent wind that blows over these stones in southern Alberta (Audio 2). And the sound has several components — a low frequency “thrumming”, a mid-range and high-frequency play of the wind. Listening to the stones over time has a measurable effect (confirmed in lab tests by the author) upon the human central nervous system — our biochemistry changes, the triggering of endorphins, for one. Audio 2 (7:55). 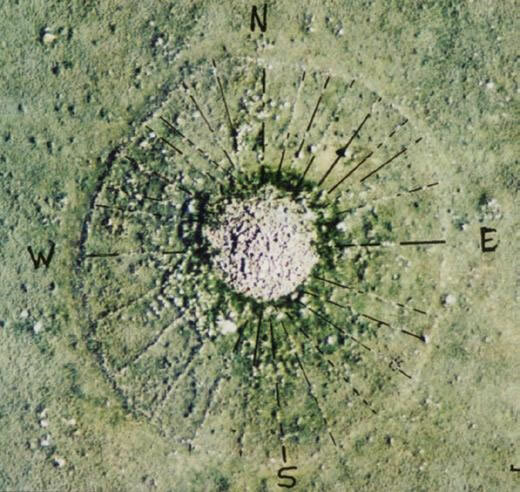 Persistent drones recorded at a “medicine wheel” stone. What I also learned is a prescribed placement of stones can shape the sound of place to create specific sonic effects (the subtle low-frequency “thrumming” in the recording is an E). What does this do to the human brain? My scientific data suggests you can have what might be described as a religious experience communing with these old stones simply by listening to them. For decades, I was obsessed with the visual artefact. While I did note the extraordinary sound of many special places, I didn’t listen as if it was important. 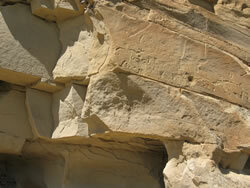 It took a long while to realize the pictographs and the arranged stones on the land were pointing toward something. And in this instance, the acoustic enclosures — call it sonic architecture — that shaped the sound of the place (Figs. 8-9). If you had to communicate cultural memory over time how would you do it? Visual and materiel culture is ephemeral. Buildings built to last rarely do. Things fall apart over time. But sound never ages. Think of a single note like C, for instance. The sound is immutable if you faithfully create the conditions for C to manifest. C is always C (kindly set aside quibbles of modern temperament; the analogy still stands). And pure sound penetrates — objectively communicating — directly to the human central nervous system, triggering a physiological response (whether the percipient is intellectually aware of what’s occurring or not). Indigenous peoples almost always refer to special places as “medicine” and they believe that rock art sites have an individual personality. 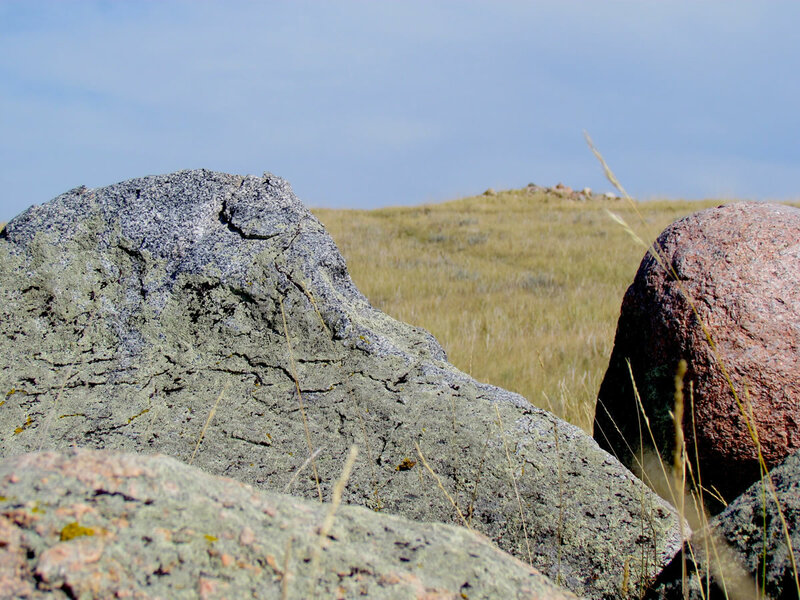 I think the old stones are telling us something — something about our past, and our future in the cosmos. And I also think they’re listening — to us. 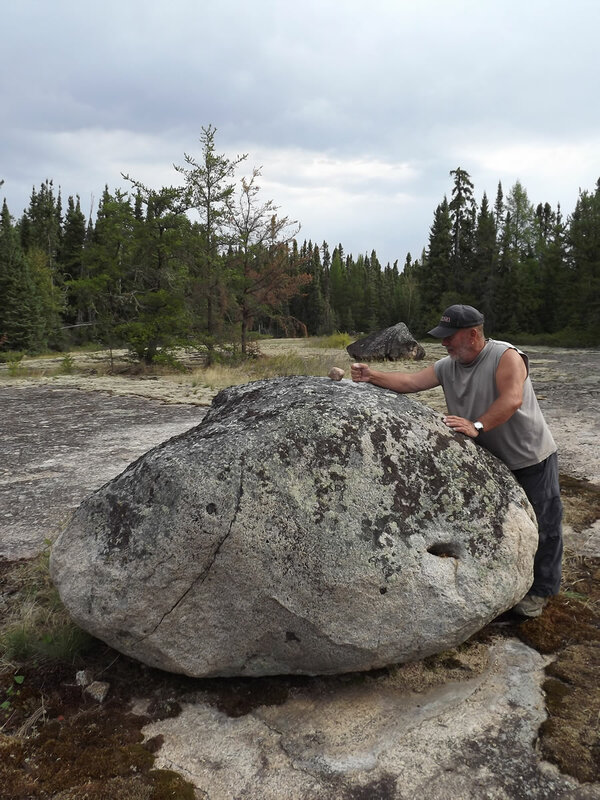 I’ll leave you with this thought from Ron Bell, the fellow who looks after the old stone arrangements you see here in the province of Manitoba (Fig. 10). Well-meaning conservationists have fenced the site off, even though it’s extremely hard to get to; unless you’re guided there you’d never find the place. Hill, Donald R. “Listening to Stones.” Alberta Views Magazine 11/7 (September 2008), pp. 42–46. _____. 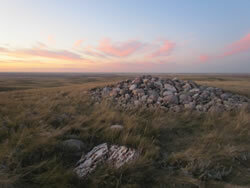 “Old Big: Is Southern Alberta Home to Canada’s Stonehenge?” Alberta Views Magazine 15/6 (July/August 2012), pp. 40–45. Lovill, Justin (Ed.). Ringing Church Bells to Ward Off Thunderstorms and Other Curiosities from the Original “Notes and Queries”. London: Bunbury Press, 2009. Don Hill is a sound artist, broadcaster, and man about the planet. 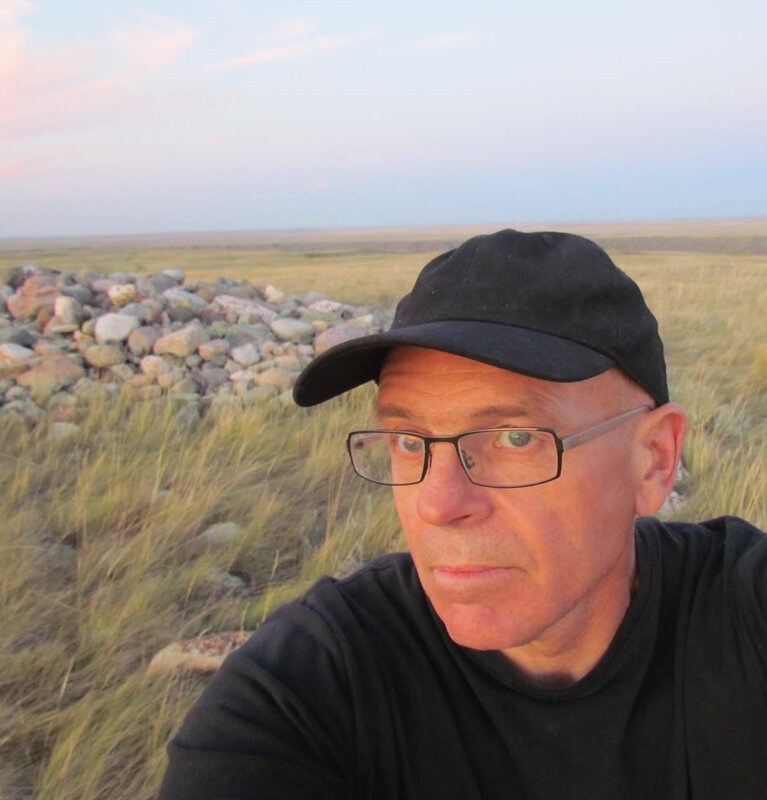 Based in western Canada, he travels extensively, giving talks, listening attentively to “songs in the land,” and making media. eContact! 17.3 — TIES 2014: The 8th Toronto International Electroacoustic Symposium (September / septembre 2015). Montréal: Communauté électroacoustique canadienne / Canadian Electroacoustic Community.